Hello! It's Tiffany here with another fun and easy-to-follow video tutorial! This time I'll be demoing how to combine the Stamper's Big Brush Markers and Gelatos with Clear Photopolymer Stamps to make an easy beautiful card. Many of you may own the Design Memory Craft Mixed Media Sampler and may wondering how to use all the products included to make a cohesive project. Well, look no further! I'll show you how in just over 5 minutes! 2 Peas in a Bucket is kicking off a Design Memory Craft Project Challenge. For complete details and how to enter go here. Hi everyone! RIta Barakat here with a few techniques using Gelatos! Hi! It's Jill here sharing a card I created with simple stamping and coloring using our Art GRIP® Color Pencils. 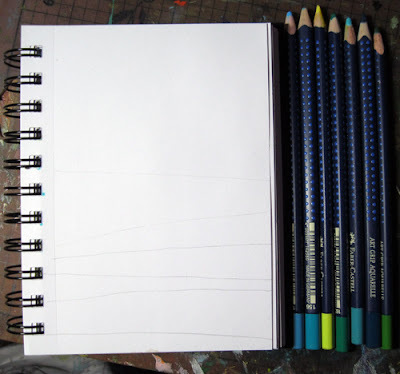 I love how smooth and effortless these pencils are when it comes to blending and shading. And of course, you can't beat the vibrant colors. I don't know about you but I'm starting to panic over how close the holidays are! I have a unique way to package a small gift such as a gift card, jewelry, or other small treasure. I had been given a few of these containers to alter and decided to try to do so with some of my favorite Faber-Castell products. You can get some of these at your local craft store or restaurant supply store. Take the handle off carefully and set aside. Open up the container and lay flat. They have a waxy finish so you will want to sand them well with some extra fine grit sandpaper first. 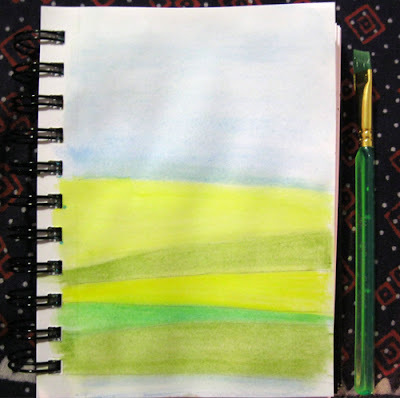 Hi everyone, Mou Saha here with another art journal page...Let me show you how I created this page in steps. I lightly sketched lines on the journal page. Filled the sections with colors using Art GRIP® Aquarelle pencils. 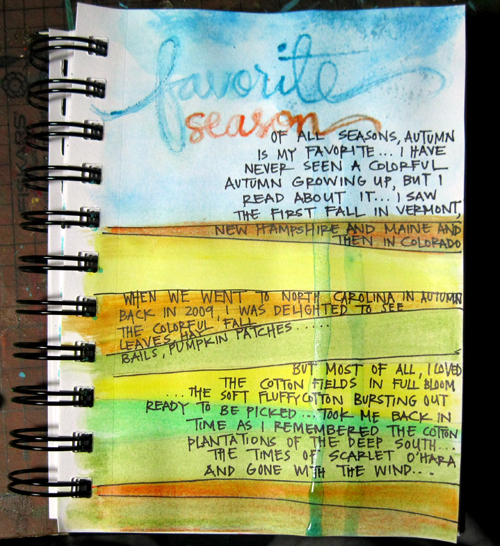 I let a little water drip down and wrote 'Favorite Season' with Art GRIP® Aquarelle pencils on the wet surface to finish the page. Pick up the December issue of Crafts N' Things and read Roberta Wax's article on Mixed Media. Roberta uses the Design Memory Craft products in her work! You can also catch up with Roberta on her Blog. Thanks for the inspiration Roberta! Just wanted to thank Brenda Pinnick for her generosity both with her time to create the posts and for some amazing giveaways! Thanks Brenda - you're the best. And.....Congratulations to all the Seven Days of Giveaways winners! Some great Brenda Pinnick and Design Memory Craft goodies are coming your way! Congratulations to Michelle!!!! You are the grand prize winner! I'm so excited to have you be the first person who is officially in my new workshop series and you will have so many fun goodies from Faber-Castell to use, besides!!!! Thank you to everyone who left the well thought out comments and who enjoyed the color questions. 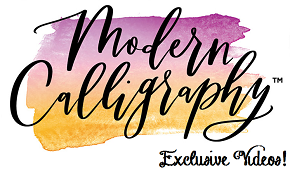 Please join my mailing list so you can keep updated on my new products and classes. And, Barbara Moore, you are the winner for day 6! Please contact me directly at- brenda@brendapinnick.com Congrats! Hi everyone, Mou Saha here with a page from my art journal creaed with Faber Castell Gelatos, Essential Tool Kit. Stamper's Big Brush pen, and Artists' PITT® pen. I started with mixed media paper cut, folded and stitched to make booklets. 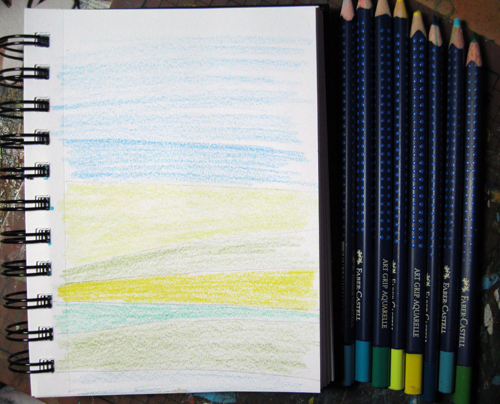 I rubbed yellow, pink and orange Gelatos along the right edge of the page. I used the little misting bottle from the Essential Tool Kit to spray water and let it drip. Next, I inked up a stamp using the black Stamper's Big Brush Pen and stamp on the right side of the page where the Gelato had dried. I added a strips of paper tape at the top left and rubbed some blue Gelatos, sprayed water and let it drip for a layered effect. I stamped a butterfly using the same Stamper's Big Brush Pen and filled in with Art GRIP® Aquarelle pencils. 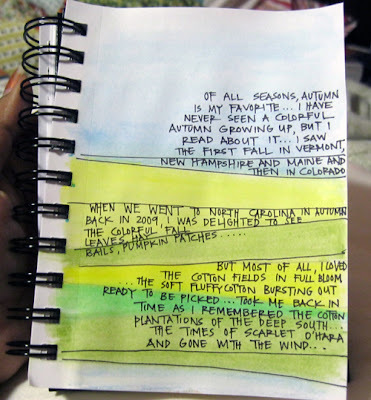 Finally, I added my journaling using a Black PITT® artist pen.